Any media inquiries related to Derek’s family should be directed to our representative through the Mesa County Sheriff’s Public Information Office, Shawn Montgomery, at shawnm@gjcity.org or by phone/text(970)260-3708. It is important that we provide the most accurate information on the condition of Deputy Derek Geer and to clarify any misconceptions that have been published. Unfortunately, Deputy Geer's condition has not improved. He is on life-support so he can perform one last selfless act of service by donating his organs. We anticipate this process to occur within the next 48 hours, after which time all life sustaining measures will cease. UPDATE: Summary of Sheriff Lewis Press Conference. At 11:06 am, deputies with the Mesa County Sheriff's Office were dispatched to the 500 Block of Fruitvale Court on a report of a suspicious male with a gun. The male was seen walking south, crossing I-70 Business Loop and the railroad tracks south of the roadway. A description of the suspicious male was aired and Deputy Derek Geer contacted a male matching the description near E Road and 30 1/2 Road. After a short interaction, in which Deputy Geer told the suspect he was being detained as part of the weapons investigation, the suspect attempted to flee. Deputy Geer deployed his taser. The suspect then fired several rounds at Deputy Geer, striking him multiple times. The suspect then fled the scene on foot. Other deputies, responding to the initial call, arrived and found Deputy Geer unresponsive. At 11:17 am, the deputies notified dispatch of an "officer down." Deputy Geer was transported to St. Mary's Hospital with life threatening injuries where he remains at this time. Law enforcement officers from every agency on the valley responded to the area to assist in the search for the suspect. At 12:04 pm, the suspect, a 17 year old white male, was taken into custody. Charges are pending. The investigation into the incident has been turned over to the 21st Judicial District Critical Incident Response Team. 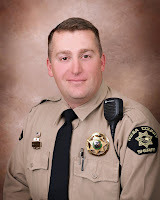 Deputy Geer is a Navy veteran and has been employed with the Mesa County Sheriff's Office since October 2001. He is a husband and father of two children, 13 and 11. The press conference that took place earlier this evening with Sheriff Matt Lewis can be found on our YouTube channel at this address: https://youtu.be/EcCXXTNPIgs. You may need to copy and paste into your browser. Our thoughts and prayers are with Deputy Geer and his family during this tragic time. UPDATE: Sheriff Lewis will be holding a press conference in the MCSO lobby at 6:30 pm. The doors will open around 6:15 pm. The press conference will be video recorded and later posted on our social media sites. Shortly after 11:00 am, deputies with the Mesa County Sheriff's Office responded to the 500 Block of Fruitvale Court on a report of a man with a gun. Upon contact with the suspect, one deputy was shot. The deputy was transported to a local hospital for treatment of injuries. The suspect fled the scene, but was located and placed into custody. Area schools were placed into lock down but law enforcement and the school district are working together to release from lock down as soon as possible. More information will be released as it becomes available.